The book was published by Brio Books of Minneapolis, MN and was printed and bound by Walsworth Book Group of Marceline, MO. It was released nationwide in the Spring of 2012. Unfortunately, Brio Books went bankrupt in late 2012. The book was that taken over by Nature Arts Press and is now distributed by Atlas Books. 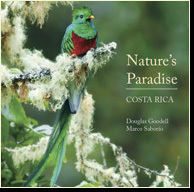 It is also available at some locations in Costa Rica and in northern New Jersey at Book Ends in Ridgewood and Wild Birds Unlimited in Paramus. The price is $40 plus tax and shipping. It is also available on-line at Amazon and Barns & Noble, and through many other fine outlets. Transfer to Nature Arts Press for more information regarding availability and ordering of books.